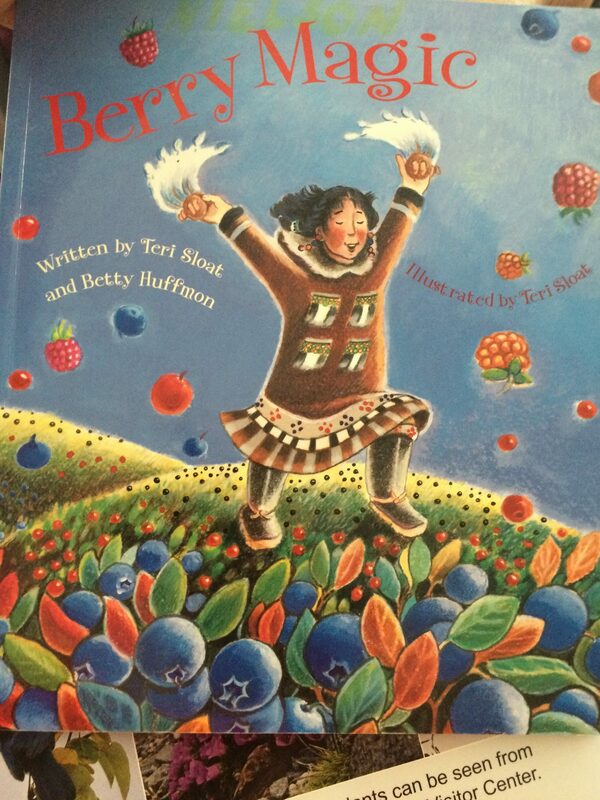 The book that I read was Berry Magic, by Teri Sloat and Betty Huffmon. I found the book to be particularity interesting because it was about how berries came to the tundra. The book began with the main character discussing how there were these woman who would pick black crowberries, and would complain about the dry bitter taste of the berries. This however, would cause our main character to have an idea and make four unique dolls, each made out of different fabric and fur. The girl then took the dolls and went into the tundra, where she would sing a song and dance and this, would cause the dolls to come to life. When the dolls came to life they would spread berries around the area. Each doll, was representative of a different berry. The berries were then picked by everyone and loved and adored because of their sweet and delicious flavor. The berries discussed were raspberries, blueberries, salmon berries, and cranberries. This book was intriguing to me because it told a story of how an area (the tundra) became so plentiful with berries. 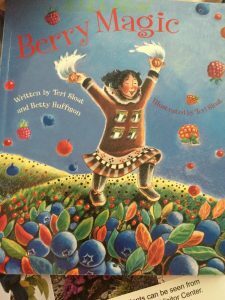 I would use this book in an english class pretty easily be having it show a way of thinking that one culture has used through story, to explain why their are different types of berries in the Tundra. This is something that I would use because every culture has a story explaining something, such as why the sun and moon alternate, where water comes from, where the plants and trees are from, etc. Each culture has one of these stories, and so this could be used to express another cultures view point, as well as show that this story telling explaining style is not at all unique to just one culture. Overall there are many different uses for this book, and that is what makes it so unique and incredible to read. This book was also written by a local native american member of the tribe and so that makes it unique because it is a first hand account of a story that has been passed down through generations. Betty is a Yup’ik Eskimo elder, and so her insight makes the story that much more amazing. It really puts a unique perspective on the matter. Thanks for sharing about this awesome book. Also, the title is just so fun! I appreciated your recap of the story and really liked your idea for using it in English class. I think this could be a great way to get students thinking about stories in their own cultures that are provided as explanations for the way the world is. It’s such a neat opening into viewing other cultures with a common topic! And how cool that the author is telling this story from her childhood experiences! I like that a good portion of this cohort want to teach English, and therefore don’t have any problem tying in these stories with their lessons. I think the difficult part of these lessons are finding content suitable for the grade levels that we will be teaching. I personally will be teaching middle school, but it is still difficult to tie lessons to children’s books. I really like the idea of using this book in an English class as a way of making cultural connections across many cultures. There are so many ways to explore stories that explain the world and how things came to be. This would make for a great basis for looking at how “explaining stories” are a cross-cultural phenomenon.